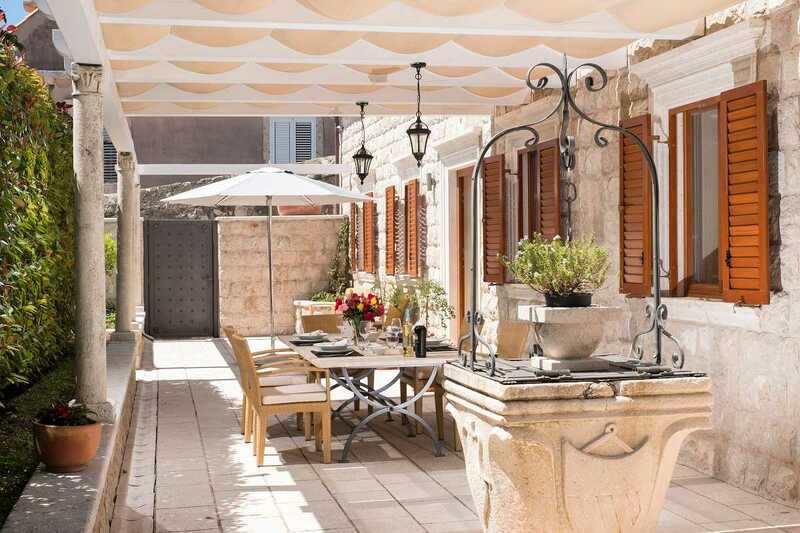 Like a tempting secret, Luxury Villa in Dubrovnik Old Town with pool, sauna, sits tucked away at an arms’ reach from Dubrovnik Old Town the Pearl of the Adriatic. 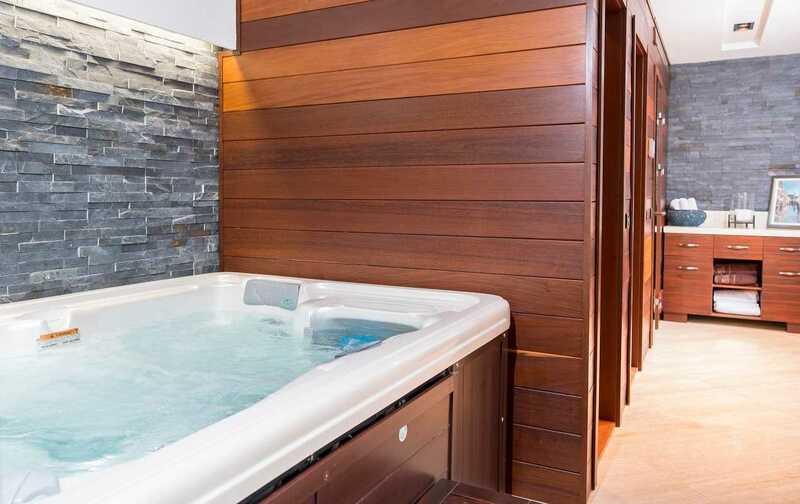 This attractive Old Town property hosts up to 8 guests in 4 bedrooms, pampers them with a gym, sauna and hot tub, outdoor private pool, expansive lounge and dining areas, historic frame and contemporary present. Originally built in the 18th century, Luxury Villa in Dubrovnik Old Town with pool, sauna, sits by the eastern entrance to the Old Town. 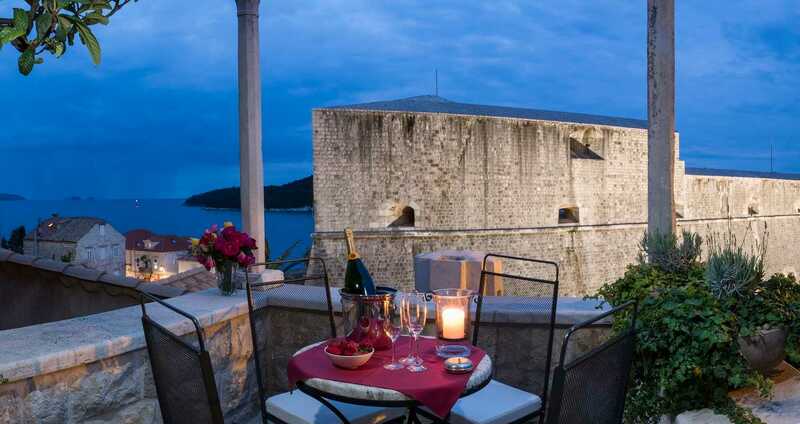 Dine at an arm’s reach from the Dubrovnik Old Town fortress Revelin, then dance the night away in the popular Culture Club in the fort. Stroll inside the Old Town walls for a quick espresso, refresh over a cocktail on nearby Banje beach, explore the corners of the bustling Old Town core, yet in a minutes pop back home whenever you please, to change shoes, grab travel guide or take a break. 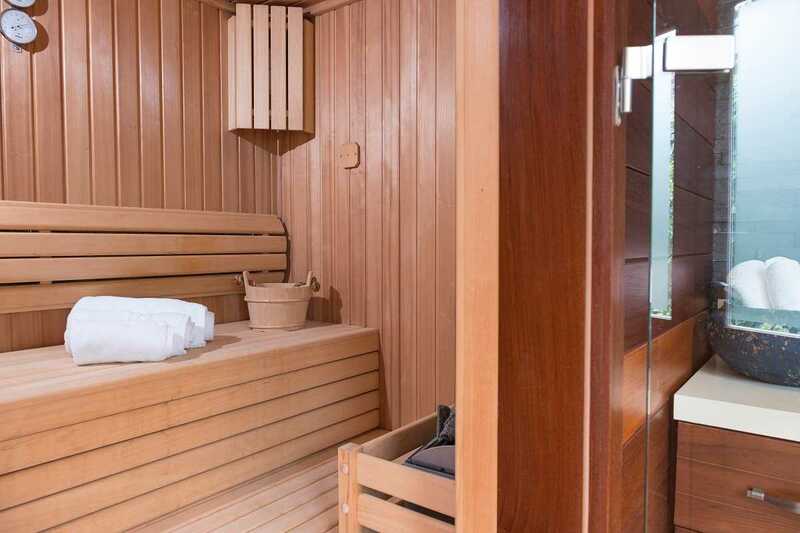 Coupling elegance and convenience into a statement, Luxury Villa in Dubrovnik Old Town with pool, sauna puts you in the prime spot to enjoy Dubrovnik to the fullest. 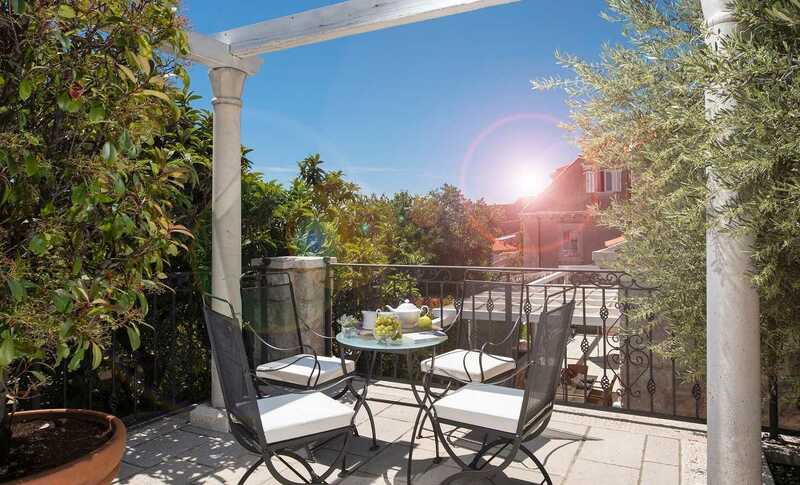 Dubrovnik villa property comprises garden terraces with sun loungers and an outdoor private pool, a large courtyard and a small panorama terrace great for al fresco dining, the holiday house and its wellness annex. It spreads over 700 m sq, the holiday house takes up 300 m sq, spread out over 2 floors. 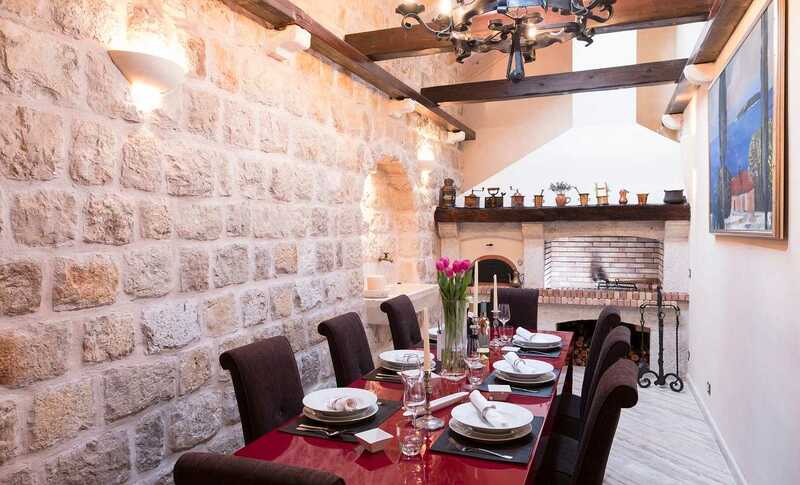 Four bedrooms with en-suite bathrooms, luxurious villa décor and thick stone walls, fully equipped kitchen with a separate dining area and overall ultimate comfort, make Luxury Villa Dubrovnik Old Town with pool, sauna, a true Old Town villa gem. 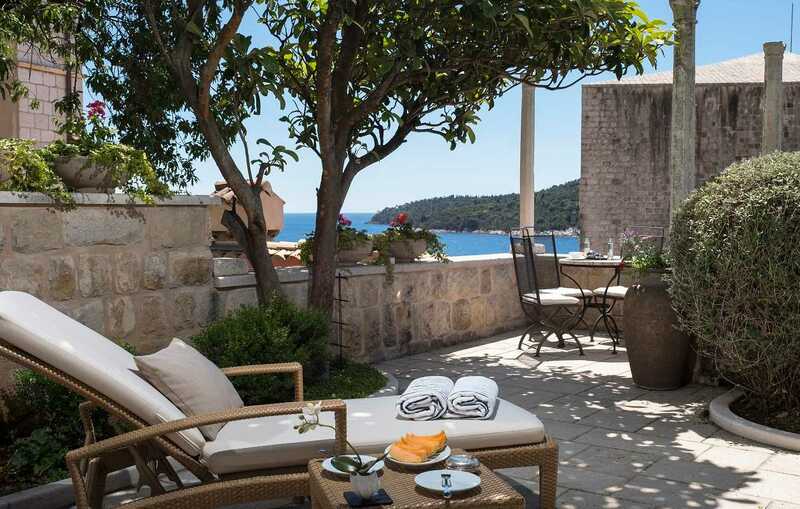 Through the main gate, enter into a shaded stone courtyard centered on an outdoor dining table for 8 and a lounge corner, introducing you the essence of Dubrovnik luxury living: leisure. The central feature of the terrace, the stone well, accentuates the Old Town Villa’s historic dimension. To your right, the terraced garden area descends to a swimming pool and a terrace with loungers. The 7×4 meter pool is the best place to swap the hustle and bustle of Dubrovnik’s popular nearby beaches for a relaxed afternoon sunbathing in the quiet. 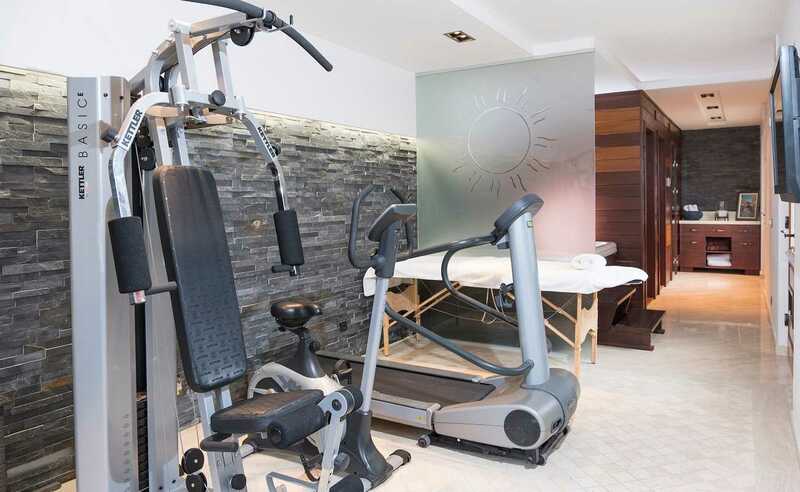 At the end of the front courtyard, find a small annex, like a corner for health and beauty comprising a gym, hot tub, sauna and a bathroom. 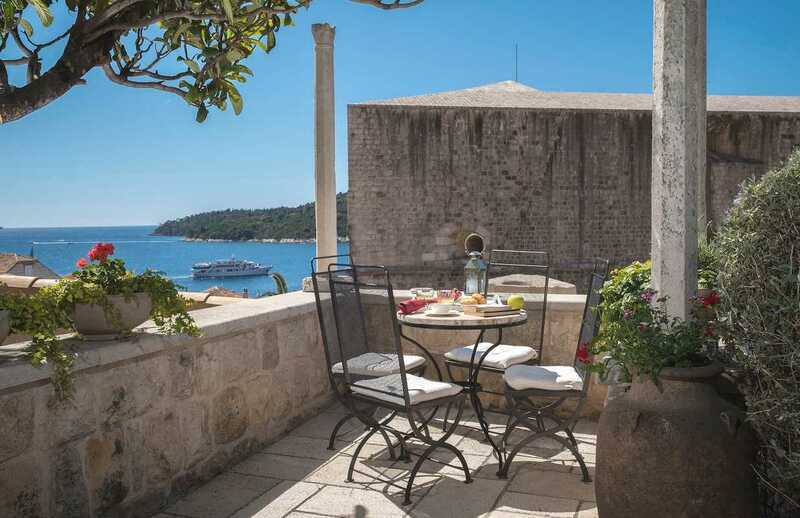 From the annex, up a few stairs to the left, one of the most appealing features of this Dubrovnik Old Town Villa: the intimate dining terrace, overlooking Dubrovnik Old Town fortress, the eastern tip of Lokrum island and a splash of the blue Adriatic sea view. 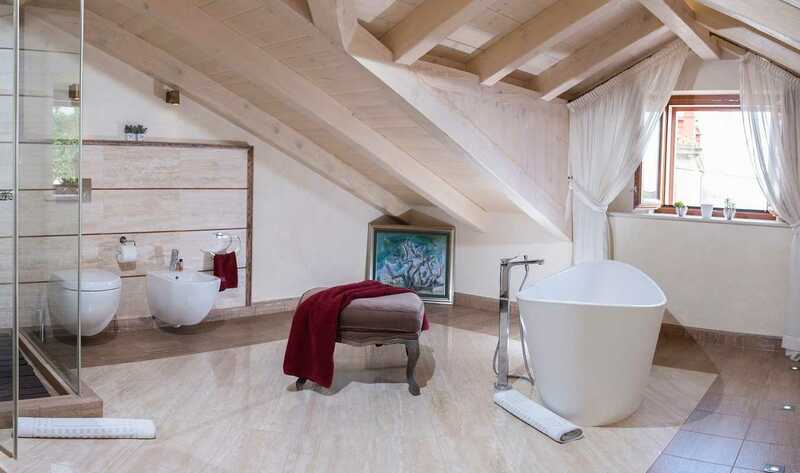 The main traits of Luxury Villa in Dubrovnik Old Town with pool, sauna, interior include a dose of classic sophistication, coupled with selected pieces of art, also bold and contemporary details. As you enter from the front terrace into the voluminous lounge with barren stone walls, spot interesting paintings and amphorae among the décor. On the other side of the living room stone wall, up a few stairs, there’s a fully equipped kitchen and a separate, interesting dining area. 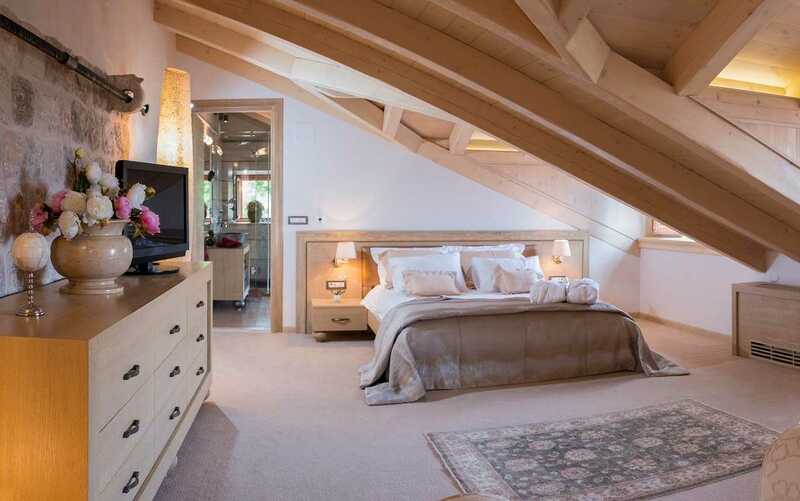 Two of the 4 bedrooms, one of them is master, are on the ground floor. 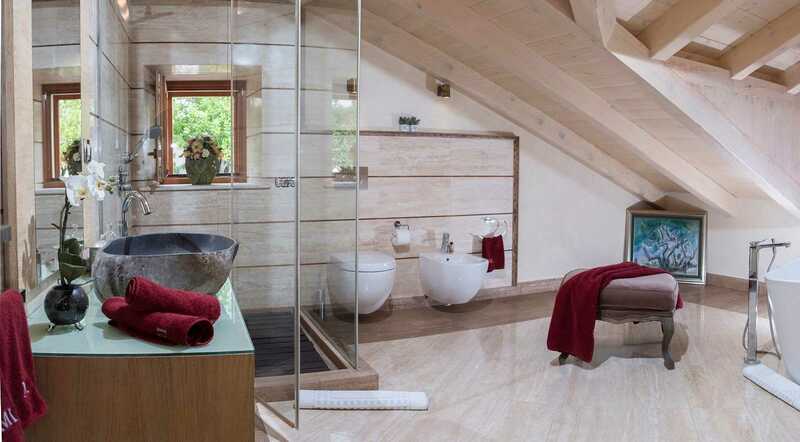 All bedrooms have en-suite bathrooms and are spacious. 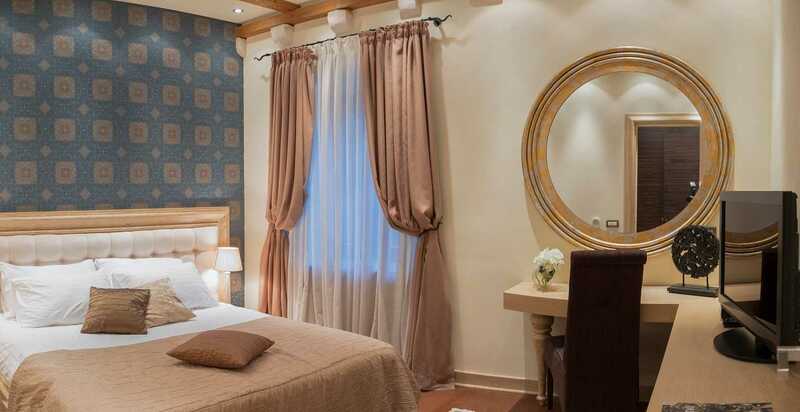 Equipped with high-quality bed and bed ware, sophisticated lighting and neutral décor, these rooms grow on you in no time. 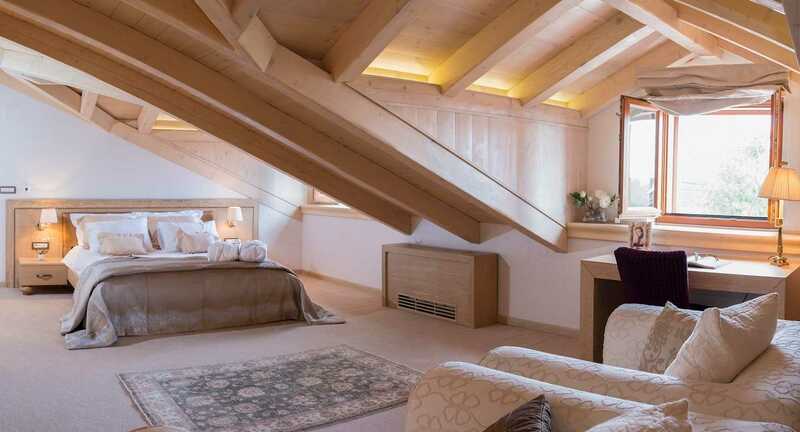 The two bedrooms in the upper floor have slanted ceilings integrated into the design. Engaging and ideally located, Luxury Villa in Dubrovnik Old Town with pool, sauna, is the top choice for all seeking a Old Town holiday residence which combines complete comfort and many treats to lure you into staying in, while putting you on the spot where everything in the world’s trending destination of Dubrovnik is so close on the palm of your hand.